I have resisted the colored jeans fad for several months now, thinking I am too old to be wearing them. But while out shopping with my mom yesterday, I stumbled across these at TJ Maxx and couldn’t resist. I’ve decided that since they were inexpensive I’ll give them a try, especially since it’s Valentines Day! I originally thought I’d wear the outfit on the right- just simple cropped jeans and this cute striped shirt- but I think with the red jeans the outfit takes on a whole new look. What do you think? I’ve added my new favorite shoes and a cute necklace to bring some unexpected color into the outfit. Have a great Valentines- enjoy your day! Am I too old for colored jeans? No, you are not too old for colored jeans! I think this outfit looks great!!! You are NOT too old for colored jeans – they look great on you! I actually like both of those outfits! Is that shirt from Target this season? Thanks!! No, I bought this shirt last season. I actually like both outfits too- thanks so much for the comment! Happy Valentines Day! Ha- I just bought red jeans a few days ago at Anthropology! If I’m not too old, you definitely aren’t too old : ) I love them and think they are so fun for spring/summer. What brand are the jeans you found at TJ’s? I may check out my local TJ because I’m sure they are cheaper than my Anthro pair. These are Blank NYC and they were $34, so definitely cheaper than a pair at Anthro! Looking at the tag I realized I got them at Marshalls, not TJ! Those 2 are so similar I can’t tell them apart, whoops! I love the red jeans! I like both outfits, though I like the stripes a little better with the traditional jeans. 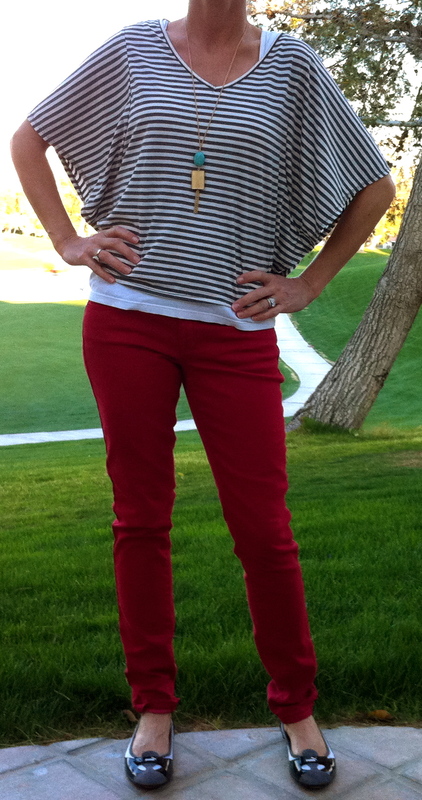 I was thinking you could pair the red jeans with a neutral (non-patterned) top and it would look great. Added bonus: then you could easily get away with adding the leopard print flats! I love the red jeans! I like both outfits, though I like the blue and white striped top better with the traditional jeans. With a neutral-colored, non-patterned top, the red jeans would look fabulous. Added bonus: you could then get away with adding the leopard print flats. I love those! Sorry for repeat post! Running in three directions at once today. Still love the jeans! I bought a pair of red skinny jeans from Old Navy about a month ago. Tags are still on them. I think you look great in them! Maybe this weekend I’ll get up the courage to cut the tags. Sorry, I think that top does nothing for your figure and makes you look like you’re trying to hide something. Your figure is cute which you can tell in other clothing. I do think colored jeans are fine though. I enjoy your daily fashion posts! Don’t be sorry! I value your opinion and have worried that this top is unflattering. It is definitely very loose and baggy, and does hide my tummy (which is my goal). Thanks for your comment! First I have to say I love your blog. I check in everyday to see what you are wearing and yes i actually feel kind of strange saying that. Moving right along. I love the outfit with the red jeans. I also bought my first pair of colored jeans a bright blue. Now that I see your outfit I am inspired to put them on. I really appreciate that! And I also have blogs that I check regularly to see what they are wearing! It’s fun to see other people’s ideas! No, they are Mia and I got them at DSW. I also bought at pair at Khol’s last summer, but they aren’t near as comfy. I looked on the DSW website and couldn’t find them- but the ones you mention I did find- and they are very similar. The heel may be a bit higher- which would be a problem for me since I like to wear them all day. Good luck and so much for writing. First, I’ll say that i love your blog, and i think this is the first time I’ve liked your “before” outfit better. I like the top with the regular denim much better. The cut of the shirt with red jeans seems a bit 80’s to me. But the red jeans look great just not with that top. Thanks for helping me rethink some of my clothes! I found 2 end of season jackets last week 70% off the lowest price that I probably wouldn’t have thought twice about had I not seen your recent Chanel style jacket post. I love both of the jackets with jeans now. Hi! Thanks so much for your comment! I actually think you may be right- the red jeans with that top is a little too 80’s revival for me! I’ll keep trying with the red jeans- I do think they are fun and I’ve got some other ideas that I think will be really cute. I have no clue how to send a pic 🙂 But, seeing you use the jacket that way instead of suit-ish came just in the perfect time for me to see those sale items in a different way!